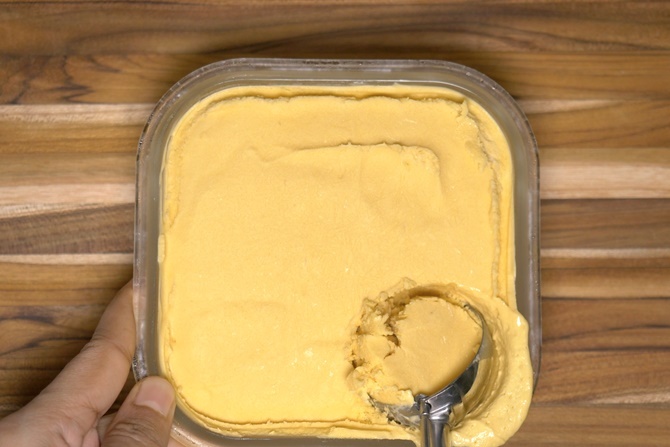 Mango ice cream recipe without an ice cream maker. There are many ways a mango ice cream is made. Over the years I have tried a few recipes and loved 2 simple methods of making this. To minimize the quantity of sugar and to keep the ice cream flavorful, use the best quality ripe mangoes that are deep in color. 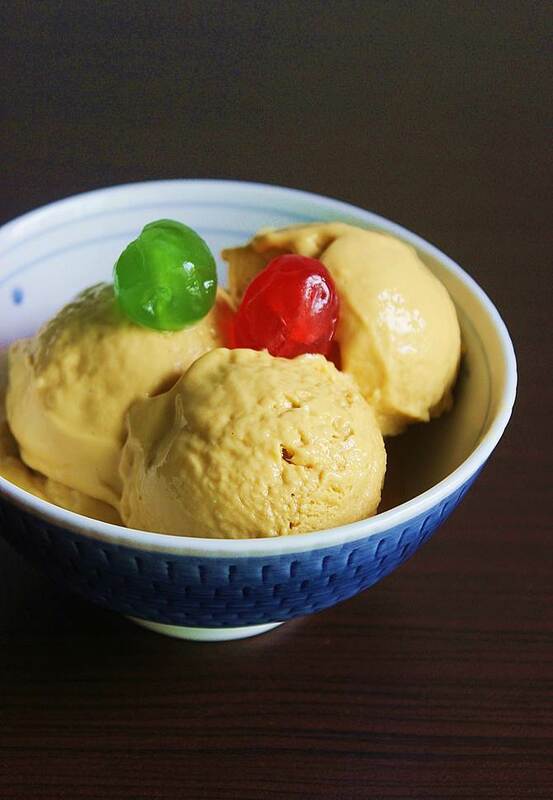 This way you will get bright, smooth and flavorful mango ice cream. I used the andhra popular variety banginapalli, you can use any sweet mangoes with deep color pulp. 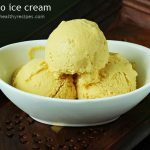 I am sharing 2 different mango ice cream recipes on this post. The first one needs a hand mixer and the second one needs only a blender. Texture wise both are different and taste good. These 2 recipes are perfect even for those who don’t have whipping cream or looking for a low fat mango ice cream & can also be made with unrefined sugar. The only 2 things I follow to get a best ice cream when made without a ice cream maker is to use high fats and avoid much of milk, juice or liquids as they tend to form ice crystals in the ice cream once it is set. This needs blending many more times to break the crystals. This mango ice cream recipe also works well with coconut cream. Since we do not prefer milk and fruit combination much, sometimes I also make this using coconut cream. Do not use sour mangoes in this recipe, it may cause stomach problems. 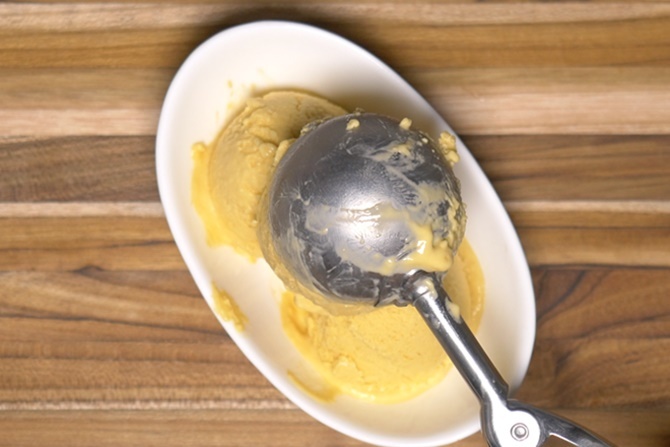 Delicious mango ice cream recipe made using mango puree and cream. This can be made without a ice cream maker. Chill the bowl, beater and the cream for few hours. 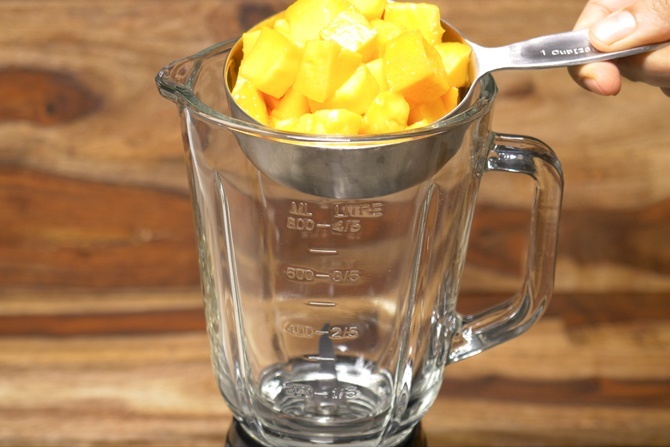 Add mango and sugar to a blender. Make a smooth puree. 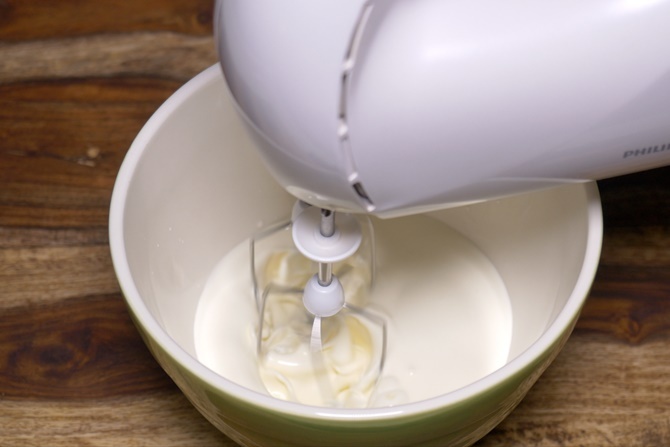 Add the cream to the chilled bowl and whip until peaks using a stand or hand mixer. Pour the mango puree to the whipped cream. Gently fold in to avoid streaks. Do not stir or mix this vigorously, this deflates the whipped cream. Pour this to a freezer safe bowl. Cover and freeze until set. 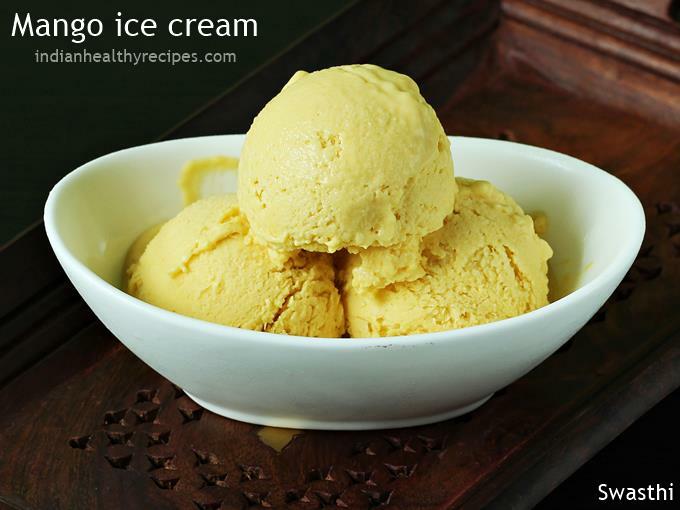 Scoop and serve mango ice cream with in 2 days to avoid ice crystals. 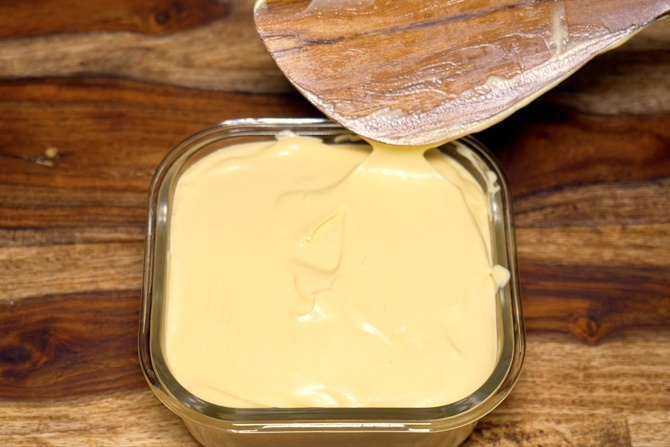 We need only 250 grams mango puree, 100 ml of fresh cream, Half can of condensed milk (about 150 grams). Pour the mix to a freezer safe container. Freeze until set for overnight. Scoop and serve mango ice cream when set. This ice cream tastes best when consumed within 1 to 2 days, after that ice crystals may form. 1. Wash and cube mango to pieces. I used about 1 and a half cups mango cubes. Add them to a blender jar. 2. Add sugar. Make a fine puree. 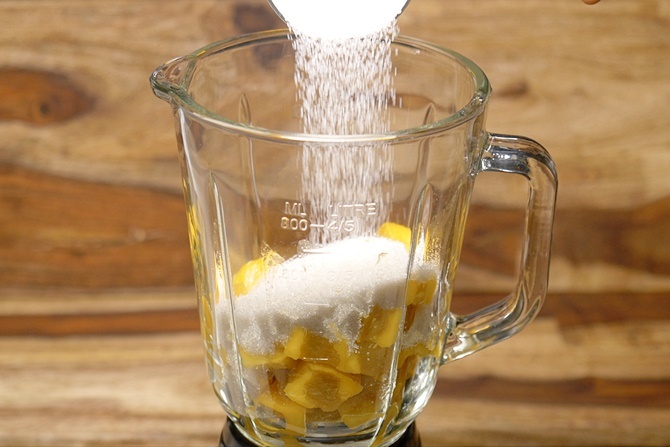 Use sugar as needed depending on the sweetness of the fruit used. 3. 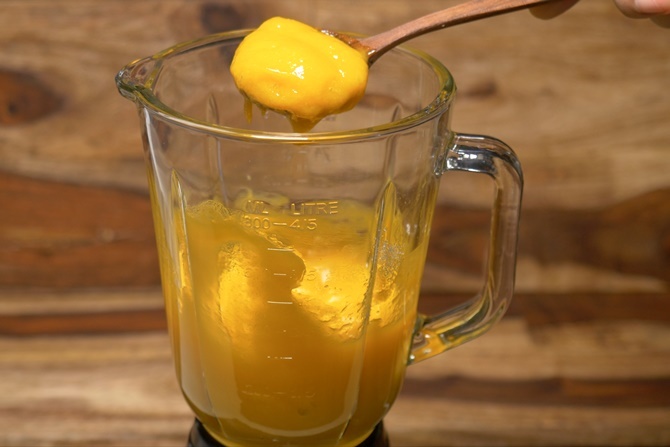 The pulp turns thick and may also gets jammed in the blender since there is no water or juice added. Give a quick stir with a spoon. Set this aside. 4. Pour the cream to a bowl. I have not chilled the bowl and beaters as it is not very hot in the place where I live. If you are making this when the temperature is high, then it is good to use a chilled bowl and beaters. 5. Whip the cream until peaks. 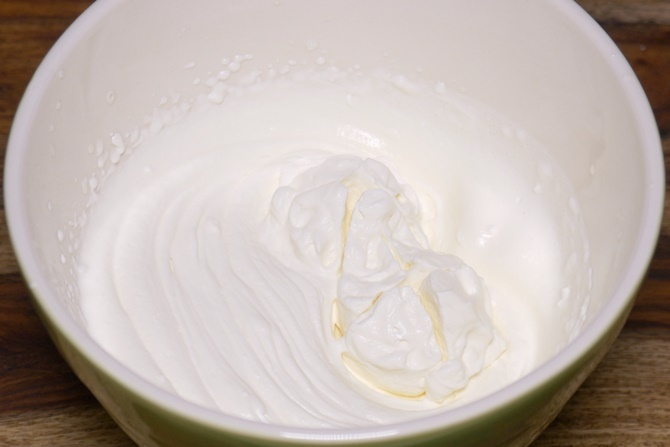 If you are using low fat cream then you may get soft peaks. 6. Do not over whip the cream, it tastes like butter after the ice cream is set. 7. Pour the mango puree. 8. Gently fold the mango puree with whipped cream. It should not be mixed vigorously otherwise the cream gets deflated and the ice cream may not turn light. 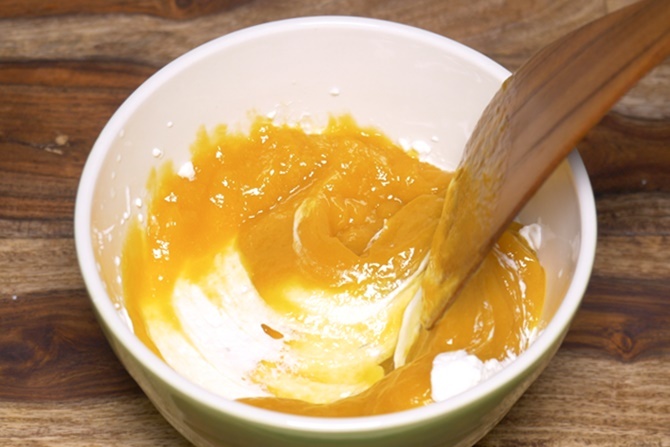 Keep folding until the mango cream turns creamy and smooth. 9. Transfer to a freezer safe jar. Cover and freeze it until set. It may take about 8 to 12 hours to set depending on the fridge. You can also pour this to steel cups and insert a ice cream stick. 10. Scoop it to a serving bowl. 11. If the ice cream is too hard, then dip the scooper in hot water and scoop. There will be no ice crystals if you use whipping cream and pulpy mangoes. I tried it it was very yummmyyyy . thankyou so much for putting up this receipe . I overwhipped my cream and added mango pulp and sugar too. It has grainy texture and tastes like butter. Is there a way to fix it now? Once you see the peaks you should stop whipping it. There is a way you can try, but not sure if it works. Keep the ice cream out of fridge and allow to melt completely. 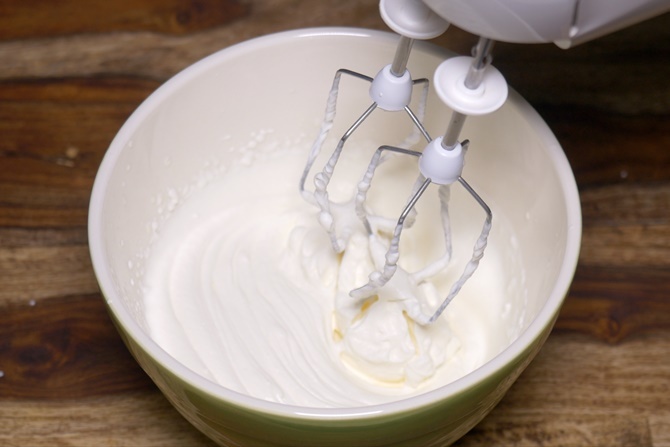 Then add about 2 to 4 tbsps of cream to the mixture and mix it gently with a whisk. Again do not over mix. While you mix, the mixture should turn uniform. Hope this helps. Looks so delicious! I will try to make this and add some chopped walnuts into it. Thanks. Thanks , yes do try it. Thank you for your reply ?, But for fresh cream can we get stiff peaks??? You are welcome. Yes with some brands of fresh cream like milky mist you can get stiff peaks. If using amul fresh cream, after chilling, You will have to scoop the top part and discard the whey, you may get about 2 tbsp of whey. Can whipped cream be used? Yes Abhinaya, you can use whipped cream. If you have whipped cream then just mix the mango and sugar puree. 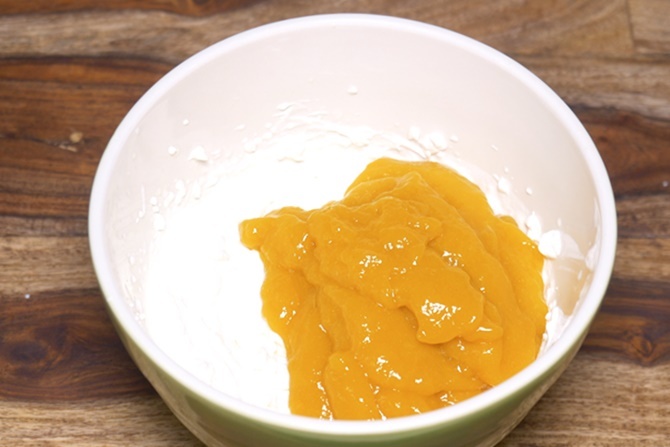 If the whipped cream is sweetened, just keep can eye on the sugar you use for the mango puree. Wow looks so creamy, no icy Crystal in it? Love to try soon. Drooling here at the pics.